ZAMBOANGA CITY - The Department of Labor and Employment IX (DOLE9) recently signed a Memorandum of Agreement (MOA) with M Lhuillier Financial Services Incorporated, a money remittance/transfer service company, formalizing their partnership for the DOLE 40% payment to beneficiaries of the Special Program for the Employment of Students (SPES) Program, Government Internship Program and Tulong Panghanapbuhay sa Ating Disadvantaged/Displaced Workers (TUPAD) Program at the MLhuillier Main Office, Cebu City. 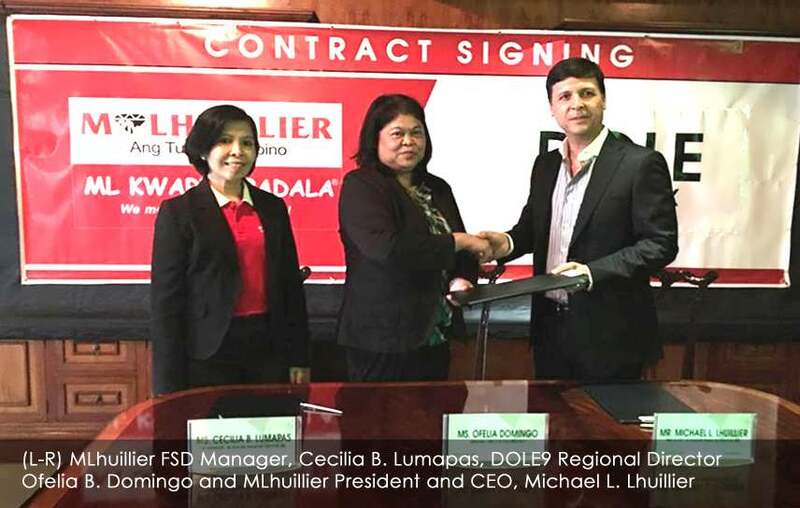 DOLE9 Regional Director Ofelia B. Domingo led the signing of the MOA with MLhuillier President and CEO, Michael L. Lhuillier. FSD Manager, Cecilia B. Lumapas and DOLE9 Accountant Ms. Renelia Genevieve L. Hamoy stood as witnesses to the inking. 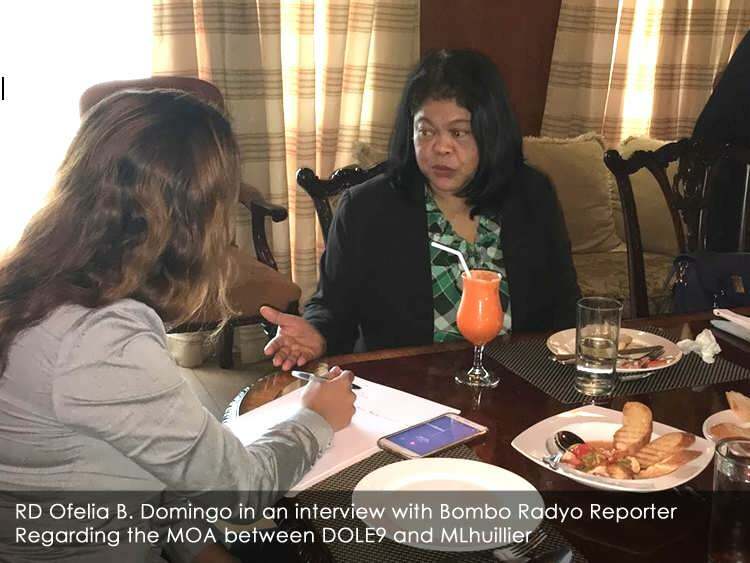 Director Domingo said that the agreement is in accordance to Republic Act 9184 otherwise known as the Government Procurement Reform Act. She added that the partnership with MLhuiller will be beneficial in fast-tracking the payments to beneficiaries enrolled under the mentioned programs. Workers and students may now withdraw their salaries from any MLhuillier branch nationwide with the use of the company's SMS facility. Prior to this development, beneficiaries are paid their salaries thru check payments which increases the process cycle time. Further delays in the release of payment is also attributed to late submissions of required documents for payment processing from the Public Employment Service Officers (PESOs) to the Field Offices and ultimately to the Regional Office. Now, beneficiaries will be provided easier access to their salaries thru M Lhuillier. Under the new SPES Law, the program aims to help not only poor but deserving students, out-of-school youth, dependents of displaced workers, and would-be displaced workers due to business closures or work stoppages, or natural calamities, who intend to enroll in any secondary, tertiary or technical-vocational institutions. These students have the opportunity to earn income during summer and Christmas vacations under the said program. Private companies and other sponsoring institutions such as the LGUs provide 60 percent of prevailing minimum wage rate per day while the DOLE provides the 40 percent counterpart. Meanwhile, the GIP aims to provide opportunities and engage young workers to serve general public in government agencies/entities projects and programs at the national and local level. Lastly, the TUPAD program aims to provide emergency employment to residents of areas hit by calamities natural or manmade. The employment will last for one (1) month and the workers will receive the highest minimum wage in the region, an insurance protection, personal protective equipment (PPEs) and working clothes specially designed for the program.